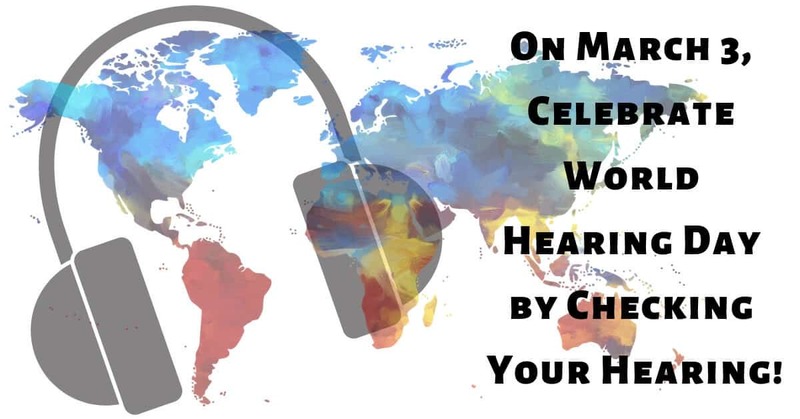 March 3 is World Hearing Day, and every March, the World Health Organization (WHO) takes this valuable time to raise awareness about hearing loss, hearing health, and how to prevent hearing loss through hearing protection and safe listening practices. The theme for 2019 is ‘check your hearing!’ and this seems very fitting. After all, how can you treat your hearing loss if you don’t have an accurate picture of your hearing health? Who is At Risk for Hearing Loss? The World Health Organization estimates that around 15% of adults worldwide have hearing loss, and this number rises to almost half of all adults over the age of 65. And it’s not just adults that risk their hearing health. According to the WHO, 1.1 billion young people risk hearing loss due to unsafe listening practices and exposure to loud noise. Many people don’t realize the risks to their hearing when they constantly use earbuds, and turn up the volume far too loud to mask distracting background noises. In fact, listening to music at full volume can lead to hearing loss in as little as an hour! The WHO recommends listening at a safe volume, and giving your ears a rest at least once every hour so that you won’t be damaging your hearing. Who Should Check Their Hearing? During World Hearing Day, the WHO encourages people of all ages to get their hearing checked. If you have teens or young adults in your family, encourage them to get baseline testing, and develop a hearing health routine by getting their hearing checked every few years. If you or your loved ones are over the age of 50, the WHO recommends annual hearing tests, so you’ll catch your hearing loss early, and be able to seek treatment as early as possible, before your overall health and wellbeing are affected. Other adults who should get their hearing checked annually are those working in noisy environments, or anyone who attends a lot of music concerts, sports events, or participates in very loud leisure activities like motorcycling or shooting, as well as anyone experiencing any ear problems. This year’s theme is based on the WHO’s desire to promote early identification and treatment. The importance of early intervention can be seen clearly in the health outcomes for those who treat their hearing loss early versus those who wait for many years before seeking treatment. If you treat your hearing loss as soon as possible, you’ll be doing the right thing for your brain and your overall health as well as for your ears. Living with untreated hearing loss has been linked to reduced mobility, damaged relationships, social isolation, depression, more hospitalizations, and reduced quality of life. Those with hearing loss also experience more rapid cognitive decline, and risk developing dementia far sooner than their hearing peers. Not only does treating hearing loss help you hear clearly, have great communication with your loved ones, and stay mobile, you’ll notice improvements in your overall health and wellbeing, maintain a high quality of life, and stay young. Many people live with untreated hearing loss for many years before getting a hearing test or a pair of hearing aids. Hearing loss is a gradual process, and as your ears adapt to subtle changes in your hearing health, you might live with hearing loss for many years without even realizing it. In fact, your family might be the first ones to notice that you can’t hear as well as you used to. If your loved ones have been talking about your hearing loss, or encouraging you to take a hearing test, listen to them! Checking your hearing is the first step towards hearing health. Visit us at Blue Wave Hearing Centers to celebrate World Hearing Day by checking your hearing. You’ll have peace of mind knowing your hearing is in tip top shape, and if it’s not, our team of audiologists will work with you to find the perfect hearing devices. From nearly invisible models to sleek, sophisticated designs, we have a full selection of hearing aids to match your every hearing need, whatever your lifestyle and budget. Don’t settle for anything less than clear hearing.